Make sure that you are doing this for the right reasons. 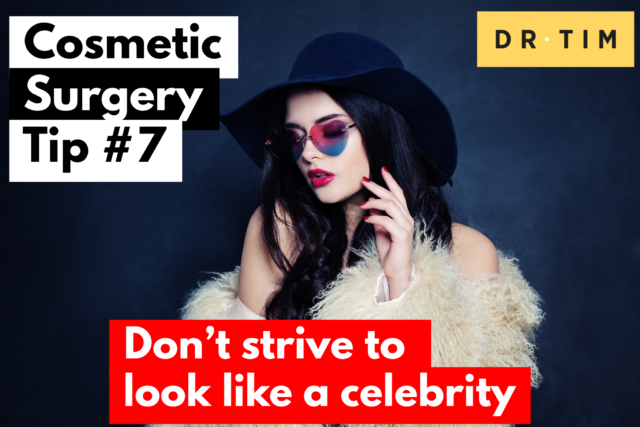 There tends to be “trivialisation’’ of certain cosmetic procedures, particularly those that are popular amongst reality TV stars. A cosmetic procedure of any kind is something to consider carefully, and is not a decision to be taken lightly. It is also unrealistic to want to try and emulate someone else’s results. Every individual is different and all cosmetic treatments should take into account, and be sympathetic towards, the individual’s existing body shape. If someone comes in clutching an image of a celebrity then alarms bells should instantly ring for the plastic surgeon. More often than not, they will have unrealistic expectations and if that is the case the plastic surgeon will most likely advise that they don’t go ahead with treatment.